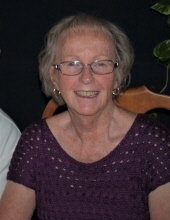 It is with great sadness that the family of Pauline “Polly” (Froehlich) Stroman announces her passing at the age of 81 on April 4, 2019 from complications due to Alzheimer’s disease. Born July 21, 1937, Pauline grew up in Tenafly, New Jersey with her parents and sisters, attending Tenafly High School and then Anderson College in Indiana and Columbia University in New York City, where she earned a Master’s degree in education. It was in high school that Polly met her husband of 56 years, Joseph Stroman, who passed in December 2018. Polly and Joe were involved in theatrical performances including musicals in high school, but their romantic involvement began after college, where both trained as educators. Joe and Polly wed on December 23, 1961, soon after building their happy and bustling family home on Sabrina Drive in Ewing, New Jersey. Their union was marked by decades of devotion to each other, their family, and their many shared interests such as music & theater, travel, friendships, and their faith. It was in Ewing that Polly treasured her role as mother to 4 children. Polly was an affectionate, nurturing, and inspiring mother, and her children absorbed and thrived on her model of family love and commitment. She was a great cook, seamstress and hostess. It was not uncommon for most of the neighborhood kids to end up at 9 Sabrina Drive where Polly prepared delicious snacks and meals for all. She hosted many neighborhood parties for all ages, legendary church choir parties, and social events for the women’s circle group. Polly was not only a devoted mother, but she also relished her role as grandmother to her “grands”: Kelsey, Heather, and Matthew Pardonner; Patrick, Michael, and Grace Stroman; Asa Stroman, and Kody and Kayla Stroman. Together with her husband, Polly spent countless hours preparing special meals, reading and crafting, and talking and singing with her grandchildren. They were a delight in her life, and she organized diverse experiences for them, such as summer trips to Maine and New Hampshire, and even Alaska. Polly was a compassionate and dedicated educator. She began her career as a third grade teacher in Cresskill, NJ, but over the course of her professional life, she taught reading at Parkway and Lore Elementary Schools and Fisher Junior High School in Ewing Township, finishing her career as a first grade teacher for 26 years at Slackwood Elementary School in Lawrenceville, NJ. Polly was a talented musician. While in college, she recorded songs with Bill and Gloria Gaither. She continued singing in church choirs until 2016. She often served as a soloist on holidays and special occasions such as weddings. Faithful, loving, and generous, and also enthusiastic, adventurous, and fun, Polly will be profoundly missed by her family and many friends. She is survived by her children and their spouses, Karen (Stroman) and Steve Pardonner of Milford, NJ; Stephen P. and Amy Stroman of Hopewell, NJ; Gregory J. and Berca Stroman of Skillman, NJ; and Jeffrey D. and Kathryn Stroman of Mercer, ME. ; grandchildren; sisters and brothers-in-law Kathleen and Leroy Osborn and Linda and Walter Schreyer, as well as nieces and nephews. She is predeceased by her parents Christine Daniell Froehlich, and Paul E. and Edna (Borg) Froehlich. A celebration of Polly’s life will be held on Saturday, April 20, 2019, at 10:00am, at The 1867 Sanctuary of Ewing, NJ. In lieu of flowers, please consider a donation in memory of Polly to: Ewing Presbyterian Church, 100 Scotch Rd Ewing, NJ 08628; The 1867 Sanctuary at Ewing Preservation Fund, PO Box 7815 West Trenton, NJ 08628, www.1867Sanctuary.org; Alzheimer’s Association, 800-272-3900, 60 E 42nd St, #2240, New York, NY 10165; or Lawrence Township Education Foundation, PO Box 6531, Lawrenceville, NJ 08648. To send flowers or a remembrance gift to the family of Pauline Froehlich Stroman, please visit our Tribute Store. "Email Address" would like to share the life celebration of Pauline Froehlich Stroman. Click on the "link" to go to share a favorite memory or leave a condolence message for the family.